This Sunday’s National Puerto Rican Day Parade will be my fifth parade serving on the Board of Directors and my first as Board Chair, but, without a doubt, it will be the most meaningful and important; not only for me but for my fellow board members, as well. Every year, since the Parade Board was reconstituted in 2014, we have used the Parade as a platform to champion critical issues and causes that have affected our community; namely, the economic crisis in Puerto Rico and the environmental injustice that has plagued Caño Martín Peña. In doing so, the Parade’s programming and messaging have helped thousands, if not millions, of individuals in our community and beyond gain awareness and understanding of these issues. And, as it has for decades, the Parade has served as a tool for parents and grandparents to teach future generations about their culture, their history, and their homeland. So now for the important question at hand: Will this year be different? The answer is both yes and no. Yes, because we have never faced a situation so dire, with a grave, humanitarian crisis that still exists for many in Puerto Rico. When one considers the thousands of families that have fled the island and now find themselves displaced without affordable housing or employment, the crisis is even more severe and impacts people and local communities all over the continental U.S. We will mourn the more than 4,000 lives lost as a result of the devastation caused by Hurricane Maria, as reported in the recent New England Journal of Medicine. With that said, the 2018 Parade will have an important and serious tone with critical messages to deliver to our community and our nation. On the other hand, much will remain the same as prior years because we will continue using the Parade as a platform that showcases the best of who are as a people and promotes key themes, tributes and messages that will address the current situation in a fact-based way; only this year, there will be extra exuberance and spirit of purpose. We will continue encouraging our community to unify our voices and efforts to drive synergies that yield the most positive impact, both on the Island and across the diaspora. So much will be the same, but this year’s Parade has the added responsibility of keeping the situation in Puerto Rico in the mainstream conversation. In doing so, we will recognize the numerous heroes that were among the first to respond and whose work has been unrelenting to this day. We will honor the Puerto Rican municipality, Morovis, which was particularly devastated and isolated after the hurricane. Despite this, they have committed to marching up Fifth Avenue in celebration of their bicentennial. We will pay special tribute to el Pueblo de Puerto Rico (the people of Puerto Rico) for their incredible resilience and fortitude in the face of unimaginable adversity. The entire world witnessed the genuine goodwill, unrelenting spirit and impressive resourcefulness of the Puerto Rican people; despite experiencing economic hardship and a life without electricity, clean water and many other basic necessities. They truly showed the world who we are as a people, and we owe it to them to march in honor of their incredible courage and determination, which proved to be a source of inspiration to us all. 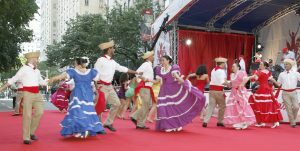 In essence, this is what can be expected this Sunday at the 61st Annual National Puerto Rican Day Parade. 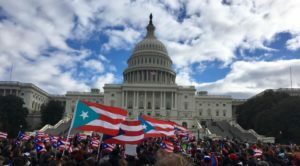 A beautiful consequence of Hurricane Maria is a reinforced sense of unity and collective purpose between Puerto Ricans on the island and those of us in the diaspora, and this year’s Parade will be a physical manifestation of this. It will also be a culmination of the Board of Director’s intense, steadfast work since September 20, 2017 – the day Maria pummeled Puerto Rico. We have worked to engage countless others across the U.S. in our efforts through donations and monetary contributions, and we have had boots on the ground in Puerto Rico to help our brothers and sisters, there. Worked with past celebrity honorees to leverage the power of their voices to mobilize our community and collect emergency items and monetary contributions. Collaborated with Daddy Yankee to collect emergency supplies at his concerts in New York, Connecticut and Chicago just days after the hurricane, promoting the effort, providing volunteers and offering a means of shipment. Promoted and supported the Hispanic Federation “Unidos” campaign to call for monetary donations, where 100% of the proceeds went to families in Puerto Rico. Partnered with other organizations, like the Puerto Rican Family Institute and Positive Image to collect food and emergency supplies, organize and pack them for shipment. Worked with other Puerto Rican Parades, churches and organizations from 15 local communities across the country to promote their efforts and to help them transport items to Puerto Rico. Organized means for transporting items to Puerto Rico; whether through City Harvest and Feeding America or as part of Governor Cuomo’s Empire State Relief and Recovery Effort for Puerto Rico. Helped organize and promote the November 19 Unity March in Washington, DC, including funding four buses to send people from New York. We also helped other organizations fundraise so they could send an additional 20 buses from all over the U.S.
Co-hosted two events for displaced families in New York City, one for Christmas and another for Mother’s Day. Installed 100 generators to families in need on the West Coast of Puerto Rico, in partnership with Positive Workforce. Awarded 30 scholarships to students living in Puerto Rico, the most of any state or U.S. territory. All of these efforts were posted on our social media channels as they were unfolding to encourage others to join us. In all, we collected over 2 million pounds of food and emergency items that were shipped to Puerto Rico. So, suffice it so say we have done a lot, and our work is far from done. Like many in our community, we are in this for the long haul, as full recovery will require our dedication over the long term, and we ask everyone – Puerto Rican and otherwise – to join us as we help in Puerto Rico’s recovery, rebuilding and renewal. Our collective community, both in Puerto Rico and across the patria extendida (diaspora), look forward to the Parade, not just as a source of prideful celebration but as a channel of information and means to be uplifted. The Parade has always had a purpose that goes beyond the celebration, and this year, the purpose is particularly profound. 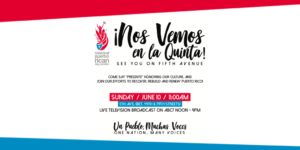 What better way for everyone to show their support than by joining us on Fifth Avenue, between 44th and 79th Streets, to honor the countless heroes and the progress that we have been able to make as a community. We ask everyone in the New York Tristate area to join us on Fifth Avenue or watch on ABC7 from noon to 4 pm. For everyone else across the country, we invite you to view online at ABC7NY.com.